(SA) Global Financial Crisis: It’s Impact On India And The World? US Economy is in worst recession since the Great Depression and the Federal Govt of the United States has already announced the massive amount of bailout package to help the ailing Financial System. After Obama’s inauguration, the question arises – will the Obama Administration fulfill their promises they have made during the campaign? You can also download the full version of this research report from here. In our “Economy in Crisis” series, we had earlier discussed about the economic future of India especially in the year 2009, which tells that the global economy will continue to contract till H1CY2009 – afterwards we might see growth in the global economy or at least the downfall should be stagnated. Since, the US President Barack Obama has won the Presidential Elections in Nov, 2008 there are lot of anticipation about how the global economy would respond under his leadership. As he understands the current economic mess, he also believes that the damage to the economy has already been done. Now the economy is in dire situation and needs an urgent action to impede the Depression type of risk to the global economy. But, how the US deal with this dreadful circumstances which affecting the global economic growth? Americans has borrowed and spent beyond their ordinary means and put the economy in deep trouble. Banks lent astounding amount of money to homeowners without having concern of credit, certain that real estate prices could go up. 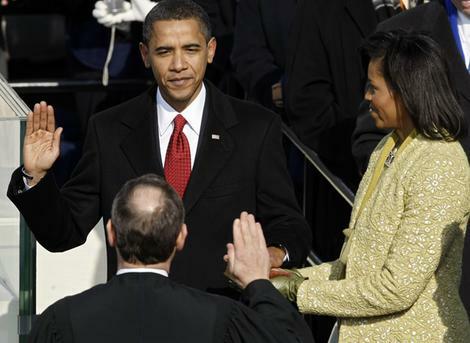 US President Barack Obama has said in his inaugural address, “that the challenges are real and they’re many”. The Economic crisis is his top priority and effective policies are needed. Unemployment rate soared to over 7%, though some economists believe the real jobless rate, including discouraged workers and part time workers, is closer to 14%. On the other side, Housing prices ceaselessly falling and have lost over $3 trillion in its value since the mid 2007, banks becomes paralyzed after huge amount of losses and afraid to fresh lending, US deficit inflated to record $1.19 trillion for the year 2008. Last year alone, the Federal Government of the United States has announced bailout of over $1.369 Trillion and the Federal Reserve has announced $2 Trillion emergency Fed Loans by expanding its balance sheet from $900 billion to over $2 trillion. But the big question is where does all this money come from? US is the largest debtor nation with over $10 trillion of national debt and to fund its trillion dollars bailout package, US will print more money or sell more treasuries. Initially, US have already started issuing fresh debt to finance its initial $700 billion Wall Street bailout package. Now the obvious question has arisen – who will finance this massive bailout amount. Of course, the Asian Tigers, which hold $4.35 trillion in foreign reserves. US need coordinated action from the East. The global leaders has already argued that the G8 (Group of 8 Developed Nations) won’t work on this massive financial turmoil, however the Nov-08 meeting in Washington D.C. when the former US President George W. Bush has called the G20 nations to joint hands cooperatively to undertake the global economic crisis. G20 nations which includes the fastest growing economy such as India, China, Brazil, Mexico and Russia has enormous amount of foreign reserves. In which China has accumulated large chunk of foreign reserves. 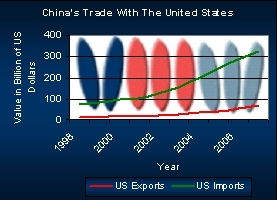 Chart showing China's Trade with the United States. US is the largest export market for China, thereby China certainly has an interest in ensuring the viability of the US economy. As of now, China holds nearly $1.9 trillion of foreign reserve assets in which between 60% and 70% has already been invested in dollar denominated assets such as US Treasury and other corporate bonds like Fannie Mae and Freddie Mac. According to the latest data available with the VMW, China holds $540 billion of US Treasury Securities. China’s savings were key reason of lower long term interest rates in the US. China needs to support the dwindling US economy by investing more in the US Treasury; however there are certain limits to the investments in to the US by China, because Chinese economy also suffers the huge crackdown in its economy despite getting Number 3 slot. GDP per capita of China is $5,325 which is still very low in compared to Germany’s $34,000. Unemployment rate also soared to 4.5% from 4% since the global economic downturn and large number of manufacturing units has halted their operations as no demand exist for their products in the international markets. Chinese economy is entirely relying upon exports and the recent export data showed the major downturn. China might consider focussing on its own economic problems. 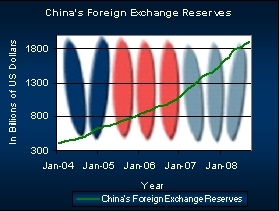 Chart Showing China's Foreign Reserves. But the another interesting point here is Japan, which has reduced the investments in US Treasury from peak of $600 billion last year due to its own economic problem and needed large amount of cash to meet its own requirement, China still expanding its investment portfolio by buying more in US securities. A European analyst has commented that China needs to spend its trillions; the world could avert the recession, thereby, some economists called it as “Chimerica” the relationship between China and America. China needs to finance the US debt in order to make the economy progressive. What should be the negative consequences of this Economic Catastrophe? According to the US Treasury data, the value of outstanding American Treasury bills top $10 trillion, double since the year 2000 and this number sure to increase as the bailout package announced to support the distressed Auto industry, preventing collapse of government backed mortgage giants Fannie Mae and Freddie Mac. This could be real problem for the United States as the foreign investors could doubt the American money to pay back such an extraordinary sum inducing them to stop or slow their deposits in to the US. That could send to Dollar plummeting and making imports dearer to the American consumers and businesses. Then the US Treasury needs to pay higher interest rates to attract investments. The ongoing crisis has a potential to inflict serious damage to the international status and power of the United States. But, does it really going to happen? I guess no! During the time of Great Depression in 1930s, US has intervened in the economy by way of taking over the toxic assets of the banks and created the new company known as Fannie Mae, which convert the bank’s assets in to marketable securities. It said to be a new wave of government intervention because the 2008 Presidential Election was equivalent to the 1932 election, when President Franklin D Roosevelt adopted the “New Deal” policy in which mortgage backed security issuer Fannie Mae founded. 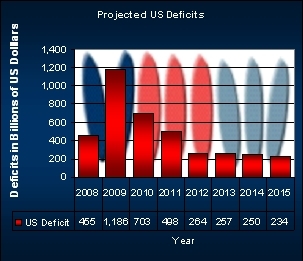 Thereby, the US will find it much easier to run into large deficits as the foreign investors continue to hold dollars and will continue to invest in the US Treasury and the new US Administration could bring some changes in its policies and they will bailout the whole economy without worrying about their finances. For Research Purpose, VMW may have used the following Sources: US’ Congressional Budget Office (CBO), US Treasury Dept, US Commerce Dept, People’s Bank of China, US Federal Reserve, BIS, IMF and the World Bank. This VMW Research is Marked as “Superannuated” by the VMW Research Team and the content of this research is no longer in use in todays economic context, however certain references and inferences in this research can be use. This entry was posted in Credit Crisis, Economic Crisis, Economy, Economy in crisis, Fannie Mae, Financial Crisis, Financial Deepening, Global Economic Crisis, Global Economy, India, Indian Economy, US Govt, US Treasury and tagged Barack Obama, Chinese economy, Credit, Credit Crisis, Financial Crisis, Foreign Reserves, Global Economy, US economy, US Govt, US Treasury by THE UNIDOW POST. Bookmark the permalink.